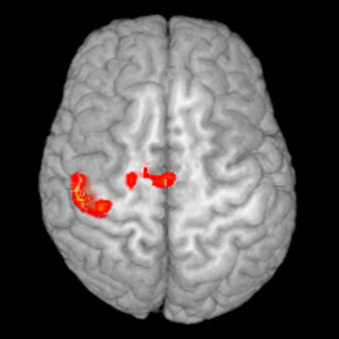 Current imaging research includes (1) fMRI studies of working memory, inhibitory control, and attention switching in healthy children and children diagnosed with ADHD (2) fMRI studies of social and non-social attention regulation in high-functioning autism, and (3) fMRI studies of strategic processes in the development of declarative memory in healthy children. The motion of internal organ targets represents a major challenge for image-guided therapy. However, in many clinical situations, the internal organ motion cannot be observed directly, so it is necessary to find a surrogate signal that is both easily observable in the therapy setting and predictive of internal organ motion. We are therefore studying the relationship between skin motion and internal organ motion using dynamic magnetic resonance imaging (MRI), in order to determine the feasibility of using an MRI-based model to perform respiratory motion compensation in image-guided therapies. MRSI shows particular promise for (1) improving the assessment of cancer location and extent within the prostate, (2) identifying extra-capsular spread and (3) measuring cancer aggressiveness based on tissue biochemistry. Stereotactic radiosurgery using Cyberknife allows high doses of radiation to be delivered to diseased tissue while limiting dose to adjacent normal tissues. We are developing MRSI-guided Cyberknife therapy for the prostate, which should increase the likelihood of cancer eradication while preserving a high quality of life for these patients. Over the past years, our knowledge of the genetic, molecular, and neural mechanisms involved in information processing and plasticity at the single cell level has increased dramatically. However, similar advances have not yet come about in our understanding of processing at the systems level, particularly involving the neural systems underlying higher cognitive functions such as vision or motor control. This deficit has been a major obstacle in analyzing the impact of brain damage on function, and has limited our ability to devise effective therapies for functional recovery, e.g., after a stroke or as a result of brain damage. Similarly, many brain disorders present a complex array of behavioral symptoms whose link to abnormal processing at the level of the neural substrate is only poorly understood. In particular, a variety of disorders, such as autism or dyslexia, present deficits at the level of sensory perception and cognitive processing (e.g., in face processing or word reading). Understanding the neural bases of these deficits might point the way to new treatment approaches. The Laboratory for Computational Cognitive Neuroscience investigates the computational mechanisms underlying human perception as a gateway to understanding information processing and learning in cortex. In our work, we combine computational models with psychophysical and fMRI data from our own lab and collaborators, as well as with monkey and cat single unit data obtained in collaboration with physiology labs. The computational model at the center of our approach allows us to integrate experimental data from all these levels to refine the model. In turn, the model can then be used to make nontrivial predictions for new experiments at these levels. In particular, the computational model allows us to make inferences from the level of behavioral differences between patients and normals to differences at the level of processsing in the neural substrate, possibly leading to new insights into the neural causes of these disorders along with opportunities for model-based therapies based on behavioral intervention. We are currently evaluating the potential of this approach by studying face processing, object recognition, and perceptual learning in normal and eventually autistic subjects through psychophysical and fMRI experiments. The overarching goal of this study is to determine if localization related epilepsy causes reorganization of language function in children during periods critical for language development. Knowledge of language systems development and plasticity in children will be gained to the extent that disruptions in normal neural networks for language function may be attributable to epilepsy. This is a cross sectional study of three populations: a group of children with recent onset epilepsy; a group of children with chronic epilepsy; and a normal control population. Location of language function networks will be identified by employing a panel of functional MRI (fMRI) language tasks. Proficiency of language and other related cognitive skills will be measured by neuropsychological testing. This study has important implications such as identifying brain regions that can sustain "reorganized" language function. Tinnitus Research Consortium: Tinnitus is one of the most common ailments of the auditory system with often debilitating consequences, yet very little is known about its mechanisms of origin. Although tinnitus is usually associated with a peripheral hearing loss from either loud noise exposure or aging-related changes, the ultimate cause is almost certainly of a central nature, because tinnitus is not abolished by auditory nerve transection. In this study, we will first perform detailed audiological screenings of the patients to characterize their hearing loss as well as quantitative psychophysical matching of their tinnitus percept (pitch, bandwidth, spectral composition, loudness) using digital synthesis. Using functional magnetic resonance imaging at high field we will generate high-resolution tonotopic mapping of the central auditory system, with particular emphasis on the auditory cortex. Activity in the auditory cortex will be compared in a block design, during a "tinnitus-off/masker-on" period , in which the tinnitus is masked by noise, and during a "tinnitus-on/masker-off" period, in which the tinnitus is perceived. National Science Foundation: Despite much recent progress in auditory cortical neurophysiology of animals and cognitive functional imaging of humans not much is known about the perceptual processing of spoken language. Although cortical areas have recently been identified that participate in the processing of human speech  as well as human voices , we have neither clarified with certainty which of the multiple areas of auditory cortex are activated by acoustic-phonetic processing nor elucidated their intrinsic functional organization. On the basis of established knowledge about the organization of the cerebral cortex in nonhuman primates, we propose a hierarchical model for the auditory processing of human speech. Using high-resolution functional magnetic resonance imaging (fMRI) at high field we will identify areas of nonprimary auditory cortex involved in the processing of speech sounds. With guidance from animal studies as well as other neuroimaging work in humans, we hypothesize (1) that thes e areas are situated primarily in the anterior portions of the superior temporal gyrus (STG) and sulcus (STS). Our second hypothesis to be tested with high-resolution fMRI is (2) that these higher-order auditory areas are organized into non-tonotopic maps representing acoustic-phonetic features along characteristic dimensions defining categories of speech perception. A significant percentage of individuals are diagnosed with neuro-cognitive disorders such as dyslexia, attention deficit disorder, and autism. These conditions can severely impede the acquisition of written and spoken language as well as other aspects of communication. Developmental disorders often have negative consequences for academic and personal achievement and cause untold distress to the individual and their families. They also place a considerable financial and educational burden upon all involved. Cognitive neuroscience is a fast moving area of research and the outcomes of these studies are shedding light on the neural basis of typical and atypical development. Educational neuroscience is an emerging field that combines brain based research with educational practices of learning. Established in 2000, Georgetown University's Center for the Study of Learning (CSL) is one of the leading research centers in the country investigating the neural basis of learning and its disorders. Its researchers combine neuroscience and clinical practice using an array of different methods to study a range of developmental disorders, including developmental dyslexia, autism, and attention deficit disorder. Understanding more about how typical learning occurs is essential to understanding the problems encountered by individuals who have learning difficulties. The center's goal is to conduct research that will shed light on the causes and effects of learning disorders, so that better programs for diagnosis and treatment can be developed. CSL's researchers have identified some of the important neurophysiological mechanisms of reading acquisition, disorders of reading and its remediation. Our mission is to use neuroscience research to help identify avenues for effective education and remediation for a variety of cognitive skills. Through this work we hope to enhance the academic and social quality of life of children and adults affected by learning challenges.